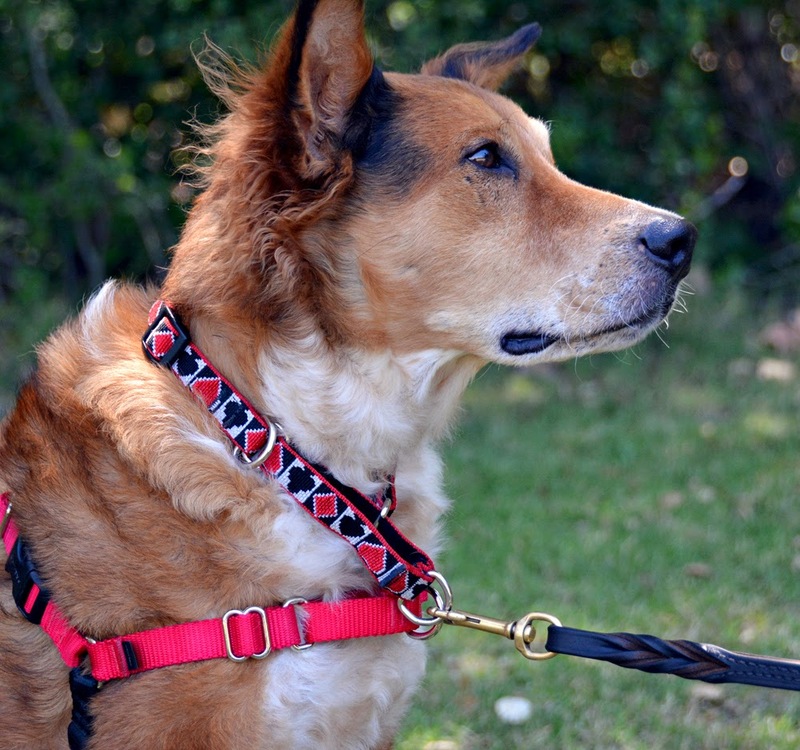 The Lupine Combo Collar is a martingale collar. It has two D-rings, a "live ring" that pulls the collar tight, and a "dead ring" that does not pull the collar tight. The combo collar is available in four sizes and two widths to fit dogs with necks 10-27" around. It can be found in any 3/4" or 1" wide Lupine pattern, and is backed by Lupine's lifetime guarantee that covers chewing damage. I love Lupine stuff, and I use it every day. We currently have three 3/4" wide Combo collars, all in retired patterns because they last forever so I haven't needed to buy new ones in years. These are my regular everyday martingales that I use instead of flat buckle collars because Brisbane's head is smaller than his neck. I also use them as emergency backup collars for rescue dogs, transport dogs, and any other dog that I would prefer not get loose and play in traffic. Of my three collars, only the blue dolphin collar is fading, and only because it is one of Brisbane's regular beach collars. My complaint about Lupine's Combo collar is pretty much the same as my complaint about every other martingale out there: the loop is too big. I know that the collar needs to be big enough to slip over his head, but there's got to be a happy medium between "too tight to get on" and "flopping around loosely". I think the loop on the Combo collars could stand to be a couple of inches shorter. I think Lupine has changed the sizes of their Combo collars since I bought mine. The website currently states that 3/4" wide Combo collars come in two sizes, 10-14" and 14-20". Brisbane's dolphin and cow collars adjusts between 14" and 20" with 4" of that being loop. The playing car collar adjusts between 20" and 30" (holy mackerel, I did not realize it got that big! ), also with 4" being loop. I keep the collar adjusted tight enough to prevent escape, but not tight enough to strangle my dog, which means it is always hanging 4" too loose, or I have a 4" long tab hanging off the collar. A 2" loop would have been sufficient, and if I had one of the smaller ones adjusted to its minimum side, 25% of the length would be loop. Pros: Super useful as an emergency backup collar for dogs that like to escape from various equipment. The immense variety of patterns means I can coordinate with other gear or make the martingales stand out. Brisbane's Lupine Combo collars are mostly different patterns than the rest of his stuff, making them very easy to locate in the collar drawer or gear bag. The Lupine guarantee makes me much more likely to use these on foster dogs who may or may not eat collars. The dead ring is a handy place to hang tags. Cons: I think the martingale loops on these are way too long. When adjusted properly to prevent Brisbane from backing out, they hang way too loose. A lot of people use these for regular collars and leave them on their dogs all the time, and they have them adjusted tight enough to look like a regular collar and therefore strangle their dog when leash pressure is applied. 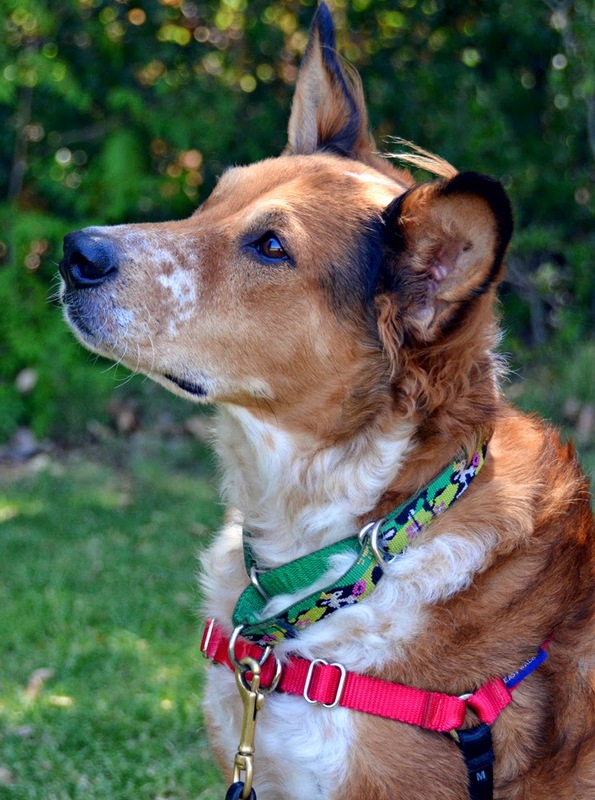 Martingale collars can strangle unattended dogs, and the loop makes them more likely to get wrapped around other dogs' faces during play. Bottom Line: For availability, style, durability, and options, these just can't be beat. I have yet to find anything I like as much, long loops and all.